Normally, I would never bother with a book like this. But the author was interviewed by some reporter on NPR, so I checked Amazon.com and there was a used copy available for all of $0.01. Why not. After all, it was rather propitious; I was writing a section of a book that dealt with the subject of “heaven,” and here was a guy who claims that he had actually been there. The subtitle calls it a “true story of death and life.” A first-person account. But it’s that 90 minutes when he was supposedly dead that Piper’s book is supposedly about. Unfortunately, it isn’t. I had a lot of questions about heaven, but Piper doesn’t answer any of them. For all of his hour and a half visit he has about two paragraphs of celestial memoir. And what he provides is pure el snoro. Most of the book is about his hospital stay and convalescence, about the depression, dependency and pain, especially from a device attached to his leg called a fixator, that has to be cranked to promote bone growth and is excruciating. In that regard it is, save for the frequent references that he would not mind returning to heaven, a conventional story of a recovery from a near-fatal accident. Here might be several neurological and psychological explanations for—and this is giving him the benefit of the doubt—Piper’s “visit” to “heaven.” The shock of the accident to his system, the pouring of adrenalin, the rush of endorphins, at least were likely to affect his imagination and the state of his cognition and consciousness. So what does Piper’s heave turn out to be? It’s a pastiche of tired biblical and, frankly, tired and silly clichés. After heading down a “tunnel” toward a brilliant light he is met by predeceased family members and friends. Rather than discussing “heaven” we get mini-bios on these beloved ones who welcome Piper warmly. They were the ages they were when they died, but “more radiant and joyful than they had ever been on earth.” He claims that “age has no meaning in heaven.” He uses the word “perfect” a lot. “when they gazed at me, I knew (emphasis his) what the Bible means by perfect love.” What does the Bible mean by perfect love. And there is a lot of very bright light in “heaven” (so bring your sunglasses). Piper does not claim to meeting up with God, Jesus, or the Holy Ghost. He doesn’t even claim to seeing angels, although he says that “My most vivid memory of heaven is what I heard. I can only describe it as a holy swoosh of wings.” He could also hear music and a lot of praising of God (in English, of course). Do you remember those stories about the “pearly gates?” Piper was looking for the gates, and found them, but they are not quite made of pearls, but they were “pearlescent—perhaps iridescent (emphasis his) . . . To me, it looked as if someone had spread pearl icing on a cake. The gate glowed and shimmered.” Wow, Im’, glad that’s cleard up. That’s it—heaven. The sort of place that might be imagined by some six-year-old in a Sunday school class, a family reunion outside a pearlescent gate to a golden city. Wow! Now where have we heard that stuff before? Sounds like some sort of Biblical theme park they might build outside of Orlando (there actually is a Holy Land theme park there, complete with daily crucifixion re-enactments). Piper has returned to his pastoral activities, although for years he told no one about his heavenly visit. He has counseled several people who have had terrible injuries like his own, and that is commendable. But none, as he describes them, have experience death, heaven and resurrection. 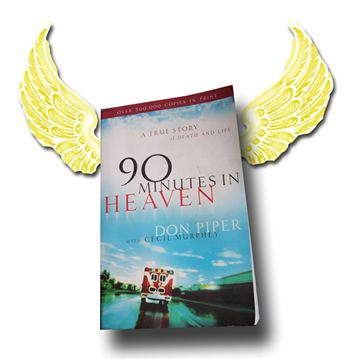 Piper writes that he is ready, even eager, to go back to heaven. He’s dead certain that, next time, he will pass through the pearly—oops!—make that “pearlescent” gates.